I wrote this article to help business and homeowners prepare to install a video surveillance system by answering that question and discussing some best practices in my experience. This guide is also useful even if you are beyond the pre-drywall phase of construction or if you are installing a security camera in a completely finished home. If you are building a new home or remodeling one, the best time to wire your house for security cameras is before the drywall is installed. It will give you the most options for where you can run cable and completely conceal it. In addition to security cameras, you should think about if you want to display live video feeds from your cameras on a TV or other monitors in your house. Here are some basic steps that I recommend to follow. Step 1: What type of security camera cameras will you use? First step is to decide whether you want to use IP cameras or CCTV cameras, because this will determine what type of cable you run. CAT-5 cable is used to wire IP camera systems. Coax cable is typically used to wire CCTV cameras. Please note that when I say CCTV cameras, I am also referring to HD security camera systems that are wired using coax cable. These types of systems can use 1080p AHD cameras and TVI cameras. If you are unsure the type of cameras you will install and want to decide later, run both types of cables: CAT-5 and RG59 Siamese coaxial cable to each camera location. It will not cost you much more and you may have use for the cable that you do not use later. Please note that you can also use video baluns to wire CCTV cameras with CAT-5 cable. I currently recommend HD CCTV systems over IP camera systems. I do not plan on going into the details of why in this article, but I will say that the quality of 1080p coax cameras is generally better than 1080p IP cameras, the price is lower, and they are easier to setup. Please email me if you would like to discuss HD CCTV vs IP cameras further. Step 2: Where will you mount your cameras and monitors? Next, decide where you want to mount your cameras. Also, think about if you want to display live video from your cameras on any TVs or monitors besides the one near your DVR. Last, consider if you want any other devices such as motion detectors or door sensors, which can be used to trigger alarms and recording on your DVR. The above floor plan notes proposed locations for security cameras, a DVR, a power supply box, 3 outdoor motion detectors and 2 spot monitors. Whether you are at the pre-drywall phase of construction or not, I recommend planning your surveillance system by laying everything out like I did above. In case you are not familiar, spot monitor is a term used in the video surveillance industry for TVs and monitors that will be used to display a live view of one of more cameras. You can learn more about spot monitors here. All of the orange arrows note the proposed locations where security cameras will be installed. The DVR, one monitor, and supply box will be located in the bedroom of the house that will be used as an office. Three outdoor PIR motion detectors are noted using the blue squares, and there will be a spot monitor in the family room and master bedroom. Step 3: What type of cable should I use? If you are going to use CCTV cameras or HD over Coax type cameras, I recommend running RG59 Siamese coax cable from all of the camera locations to the DVR location on the office. Be sure to use high quality RG59 cable that has a solid copper core. Steel core coax cables used for CATV do not work well for CCTV cameras. If you are going to use network IP cameras, run CAT-5 cable to each camera location. If you can not decide what type of cameras to use at this time and you need to run cable so that construction can proceed, then run both cable types. A cable installer should not charge you double to run two cables. Obviously you need to buy both types of cable, but it should not cost you twice as much in labor to run 2 cables instead of 1. 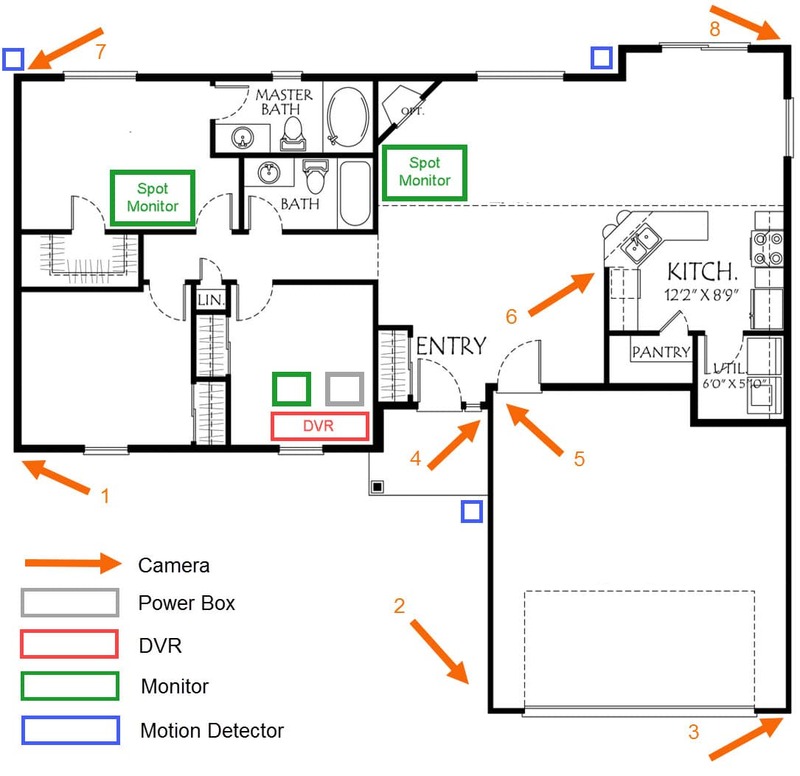 Motion detectors require two wires to connect to the alarm inputs of a DVR, plus you need to power them with another cable pair. You can use CAT-5 to run both the power and alarm connectivity. For the above project, I would run CAT-5 from all of the motion detector locations back to the DVR / power supply box location in the house. If you use motion detectors that require 12V DC, you can use the same 12V DC power supply box to power your surveillance cameras and the motion detectors. 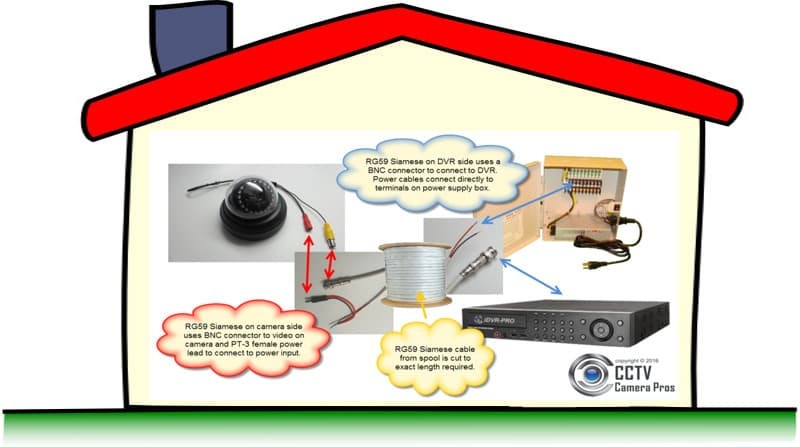 You can learn more about how-to wire a motion detector to a surveillance DVR here. In the above installation, there will be a monitor located near the DVR in the office. This monitor will be used to configure / administer the DVR. There will be two spot monitors: one located in the family room and one in the master bedroom. No pre-wiring is required for the monitor in the office. This monitor is simply connected to the DVR using an HDMI or VGA cable. For the two spot monitors, coax cable, CAT-5, or HDMI cable should be used depending on the spot monitor output(s) of your DVR. Some DVRs use a BNC composite output for spot monitors.. If this is the case, you should run RG59 or RG6 to each spot monitor location. If your DVR uses an HDMI connection for the spot monitor output, you need to decide if it is better for you to run an HDMI cable to each location or if you should run CAT-5. HDMI cable is not very flexible and usually not practical to run long distances. For that reason, HDMI over CAT-5 systems are available. These consist of a small box that you attach on each end of a CAT-5 cable. These transmitter / receiver boxes each have a CAT-5 input and HDMI output on them. If your DVR only has one HDMI spot monitor output, you will also need an HDMI splitter. Same goes for composite outputs, you need a CCTV video splitter if your DVR only has one spot monitor output and you want the signal to go to more than one TV / monitor. When you are ready to connect your cable to your security cameras, DVR, and other devices, please take a look at our RG59 Siamese cable wiring guide for security camera systems. Whats is the Best Coax Cable for CCTV Camera Installations?